It's beginning to look a lot like a standard hope-you're-happy and non-denominational time of year! If you don't celebrate Christmas, then all the themed games that come out around this time of year might be a little much to take. So with that in mind, this week's Weekday Escape is only going to feature one Santa-ridden title, while the other two are your standard "trapped in a room, oh noes!" affair without being seasonally tied. Besides, since when does it need to be a certain time of year to celebrate with no1game, Yamino Kagura, and Just Pine Games? MY REVELRIES WILL NOT BE CONSTRAINED BY YOUR PUNY CALENDAR. My First Christmas Tree Escape - no1game is making spirits bright with this cute and simple treat about a little girl who finds herself in charge of decorating the family Christmas tree for the first time. She's a little worried she's going to mess up since she's only in kindergarten, but man, come on, kid. There's no bawling in Christmas. This is serious business! It's as adorable and silly as you'd expect, though the lack of a changing cursor to indicate interactive zones means you'll still need to click around a lot whenever you're stuck in case something is hiding somewhere sneaky. But hey, arguably that adds a bit of realism. Who hasn't had to spend an extra minute (... or hour... ) hunting down all those extra decorations that seem to have somehow vanished from one year to the next? Room With Designed Windows Escape 2 - Yamino Kagura always makes escape games that tend towards the minimalist, and this tidy title is no different. The style of this sparse room is a little art deco, provided your definition of art deco is "only four real colours and a bunch of shapes", and to find a way out you'll need to make sense of all the numbers and coded locks staggered about. Colour is going to play a fairly big part in unlocking the exit, so you'll want to make sure you look closely at your surroundings and think of all the ways they can be interpreted and applied. I guess having a clean, minimalistic room really forces developers to get smart with their puzzles. I can only imagine their reaction if they had to make an escape game out of my office... "What am I supposed to do with a bunch of Spider-Man graphic novels, a white board covered in vulgar jokes, and a sullen betta fish?" Gangster's Escape - Just Pine Games serves up some swank in this escape, as you try to find another way out of a club, since apparently there's a whole lot of gangsters milling around outside just waiting to put the squeeze on you, as gangsters do. (~*~just gangster thingz~*~) A changing cursor helps you explore expediently, you can click one item in your inventory and then another to try to combine them, and a mellow, funky jazz soundtrack sets the tone. This one is mostly straight-forward, with a satisfying mixture of clue codes and item usage, though maybe in the future you should try to do non wise guy type things if you don't want to keep getting put in these types of situations, you dirty rat. Weekday Escape N°54 Walkthrough now available! Open to a view of a bed under a window. 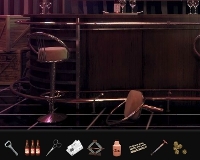 To the bottom of the screen is a table with a list of items we need to escape. Go right to see a pink table and chair, as well as a bookshelf. Go right to see a cabinet with locked doors and two drawers down below. Go right to see the exit door and a shelf with a locked box and a card on the second shelf. While facing the exit door, take the DESK PAD (looks like a card) from the shelf under the locked box. Go left to the cabinet view and zoom in on the drawers. You are now looking down the front of the cabinet. Take the SNOWMAN ORNAMENT from the top drawer and a KEY in the bottom drawer. Go left and click on the red book on the bookshelf (the second shelf). The front cover comes into view and you see a number of stars with different shapes. Take the DESK PAD and use on book. There are three holes in the DESK PAD which correspond to three stars. Note the shapes of the stars which are left visible as well as the size of the holes through which they are visible. Close the view of the book and zoom in on the area to the right of the bookshelf to collect the BALL ORNAMENT. Zoom back out and zoom in on the area between the desk and the bookshelf to pick up the TINSEL GARLAND. Zoom out and move the chair to get the BANANA on the table. Go left and zoom in behind the bed head to get the STOCKING ORNAMENT. Note the order of the colours of the various stockings. Zoom out and click on the window, which is currently locked. The lock is on the right window and has three stars in circles. You need to select the appropriate star shape for each circle by clicking on the square buttons below each one. Use the patterns observed from the cover of the book. Open the right window and hand the monkey the BANANA to get the STAR ORNAMENT. Zoom out and go left to use the KEY on the locked box. Collect the CANDY ORNAMENT. Zoom out and go left to face the cabinet. Click on the locked doors to see how to unlock them. There’s a 2x3 grid of 6 black squares. Click on the squares to change the colours. We need the correct colour code to unlock the doors. The only clue we have that’s laid out in this 2x3 pattern is the STOCKING ORNAMENT. Take the LED TUBE LIGHT from the open cabinet and note that your inventory is now full. Because now you have all that you need to decorate your first Christmas tree. Go back to the bed view and zoom in on the table. Then place all the remaining items in your inventory on the table. Nothing spectacular happens when you do this, but trust that you’re now free. Zoom out, turn to the door and click to tell Mom that you’re all set! 'I'm not get ready yet'. And there's no tree, so I bet I need to go through that door. Actually stuckinabasement, you can do as you originally intended. You don't need the beers to inflate the tire. maybe be used like that, but since beer tends to naturally be a little bubbly, it would be harder to tell what is air leaking and what is just beer fizz. A bar's with a garage is bound to have water somewhere, which makes much more sense. you need to lay out the items on the table to make sure you have them all. I guess something about being in kindergarten means you have to do this instead of just ticking off items on the list. You have to do that because your mother tells you to do that in the intro. Gangster's Escape was really fun! I'd have liked more puzzles that weren't just combining the right items, but it was still a good escape game! Hespetre, I got stuck on the same part in My First Christmas Tree, I figured it out through random clicking haha. you have to place each set of items on the table around the note before leaving. And don't worry, I only indulged after reaching my safe house. Because even wise guys need to be responsible drivers. Stuck on My First Christmas Tree. Only puzzle I can't figure out is the color lock. It's marked with a snowflake, but I haven't found snow anywhere. Benabik, that puzzle had me puzzled too for a while. The snowflakes can be found on the socks, and even if you've already placed them on the table, you can still see the colour order in your inventory. The "G" on the red circle piece stands for "Green"
Place everything on what table? What note? I have everything, can't get through the door. I know it is the sock color, but I put in the sock colors (Top row: R G B, Bottom Row: Y G R) and click the round circle and it just resets them to all black and the door won't open. David Cook, look again, you've misplaced two of them. open the drawer with the two coloured buttons using the pattern of coloured star on the exit door. First off, notice that clicking the buttons on the drawer changes the colour from R to B to Y to G, then back to R.
Also notice that this is the same order of colours on both sides of the door. 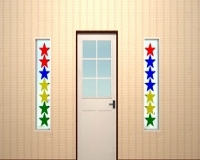 You have to press the buttons in the correct order that will make the left and right buttons follow the pattern of the left and right stars on the door. When I click on the Weekday Escape picture from the home page, I'm led to a page with links to several weekday escapes as if the link for the picture is a Weekday Escape tag. Done with Room With Designed Windows Escape 2! 317, take pointer thing, notice box with three shapes on it. BLUE 15 and you get RED BLUE YELLOW --> 23 15 46. Press coloured buttons from 1-6 i.e. Never mind - got the jukebox!